Coffee leader company and Desall invite you to revolutionise with your talent the world of capsule coffee machines, designing a disruptive product, with a unique and international style, able to adapt to the several environments, from your home to your office, that thanks to the technological innovation and ease of use allows you to obtain different beverage typologies with one single machine. Coffee leader company is one of the benchmark players in the world for the coffee capsules industry and is now planning to enter the market with a revolutionary coffee machine that is able to address the several needs of the international demand with a high-end product. At the Client discretion, the gallery might be turned private after the third day following the winner announcement. Not only do we love good tasty coffee, but we also have a great passion for well made things. This is why every day we try to improve our technologies and products, to share with you our passion, turning your coffee moment into an unforgettable moment. So we have launched The Coffee Machine Competition, in order to realise with your creative talent a new coffee machine with a disruptive design that might adapt to several environments, from your home to your office, to serve you a cup of good tasty coffee with a distinctive style. Product typology: coffee machine with capsule system (with direct pour). Style: the new coffee machine will be a really innovative product, with a distinctive design but suitable both for home and work environments, with an appeal that satisfies all age groups. Functioning: the coffee machine will be completely automated and will be able to work with several capsule typologies according to the desired beverage. The actions the user is required to perform are: taking the desired capsule, opening the automatic capsule tray and inserting the capsule in the relevant housing. Once the tray has automatically closed, the machine will recognise the capsule typology inserted. Next the user will only have to select the quantity of beverage desired, causing also the coffee machine to start the coffee preparation. Coffee pouring: the machine will sport a unique spout group (one cup per time) with direct pour in the cap (do not include any duct/junction or similar items for the coffee pouring). Consequently the cup and the spout will be in the same axis. Capsule management system: the machine to design will have a tray for the capsules insertion and will be placed frontally. The tray will have an automatic opening/closing system (horizontal movement, like the one used in CD players). Overall volume for the coffee preparation system: for the correct realisation of your proposals, consider that the coffee preparation and the capsules management systems will be included in an overall single volume, measuring minimum 145mm width, 160mm height and 325mm depth. Inside this volume, considering a frontal orientation of the machine with closed tray, the coffee spout axis and the capsule will be positioned centrally at 100mm from the front. Exhausted capsules tank: the machine will also have an automated system for the discharge of exhausted capsules, which are collected in a removable tank with minimum capacity of 1,5 litres. Cup support tray – drip tray: considering the several beverage typologies that this machine can prepare, the cup support tray shall adapt to the chosen beverage. You are required to design a solution that can guarantee at least the following two heights: 75mm and 160mm. The heights are to be measured from the coffee spout to the cup support tray. For the correct realisation of your projects we remind you that the cup and the coffee spout are in the same axis. Control panel: consider that the machine will have a capacitive touch display measuring at least 100x70mm. Other components: for the correct realisation of your projects, include also a pump and a boiler, which will be positioned outside the volume of the coffee preparation system detailed above. Target: the new machine will address a very wide public, coming from different age groups and suitable for several environments, from the domestic kitchen to the office. It seeks to become the new benchmark for coffee capsule machines, able to manage with a single product the several beverages most loved all over the world. Values to convey: disruptive, technological innovation, ease of use, cleanness. Deliverables: to better evaluate your proposals, include at least one rendering of the project in a 3/4 oriented view on white background and possibly another render with a domestic or office environment setting. Remember to attach the development files (CAD, 3D files, extra renderings, etc.) in a .zip archive. Don’t forget about the abstract and description to give further info about your projects. You can submit as many entries as you like! Participation is free of charge and open to designers and creative talents of any nationality aged 18 years or older. Participants can present one or more projects, but only the projects published on the www.desall.com web site, via the upload page related to “The Coffee Machine Competition” will be accepted. The selection of the winner by “The Coffee Machine Competition” will be the result of an unquestionable evaluation and it will take into account originality, feasibility and consistency with the brief presented. For the duration of the option right, the Client offers an extra chance to all participants setting a price of Euro 2,500 (two-thousand-five-hundred) for the purchase of the license for the economical exploitation of the projects not-acknowledged as the winning proposals. For the correct realisation of your proposals, note well that: 1) the Exhausted Capsules Tank should be positioned at a lower level (along the y-axis) with respect to the "Overall volume for the coffee preparation system”; 2) you should include all the quoted measures for your projects, in order to give an idea of the overall size. 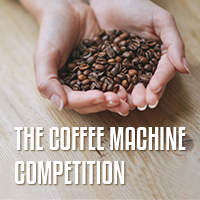 Do you want to stay updated about "The Coffee Machine Competition"?